The very idea of pitting David Dunn (Bruce Willis) from “Unbreakable” and Kevin Wendell Crumb (James McAvoy) from “Split” against each other is exceptionally tasty. Title it “Glass,” add in criminal mastermind Elijah Price (Samuel L. Jackson, also from “Unbreakable”) cackling on the sidelines, and you’ve got the recipe for a unique sequel for two totally different movies. Alas, M. Night Shyamalan happened. To be more specific, self-indulgent, overthought and boring Shyamalan happened. “Glass” is one of the biggest missed opportunities ever and actually harms the overall good will felt towards its predecessors. “Glass” could have been a slow burn detective-style story about Dunn, an indestructible man, hunting down a tragically schizophrenic killer who is being egged on by a true villain. Nope. 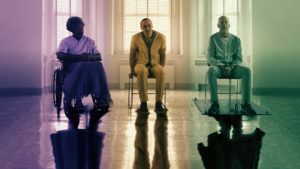 Writer Shyamalan (the worst version of him) has them all incarcerated then institutionalized in the first 15 minutes of “Glass.” We then spend the next 100 minutes psychoanalyzing what it’s like to think you’re a super hero. Shymalan also rehashes most of the elements in “Unbreakable,” which doesn’t make much sense at all. Dr. Ellie Staple (Sarah Paulson) is tasked with getting these three people to realize they are not supernatural in any way, which of course we and they know is not true. David is the only one that seems to doubt his abilities, which is completely insane as he’s been using them for nearly two decades to help catch Philadelphia bad guys. If anyone is sure they have super powers, it would be him. Even when it’s moving at a painfully slow pace, you’ll keep saying to yourself that there will be a payoff in the end. Even when “Glass” finally does get to the big finale, it’s an absolute let down. The director version of Shyamalan is usually reliable and is capable of staging a suspenseful scene, but the action here is dreadful. Nearly every main character is present, but it’s shot and edited so poorly that it seems like none of the actors were on set at the same time. There actually may not be one frame of film that shares both Willis and Jackson. It’s impossible for McAvoy to sleepwalk through a role in which he plays about 20 characters and he’s just as great in “Glass” as he was in “Split.” He transforms from person to person in seconds and the amount of energy he exudes is fairly amazing. The fact that McAvoy is able to act out what seems like every accent on planet Earth is astonishing. Bruce Willis’ newest portrayal of David Dunn is even sleepier than the last. In “Unbreakable,” he was a sad sack on the verge of divorce so his funk made sense. In “Glass,” he seems to have embraced his vigilante justice role, but Willis looks like he can barely keep his eyes open. Samuel L. Jackson is on the other side of the spectrum. His lowkey, cool bad guy has evolved to a wise-cracking googly-eyed weirdo. If that’s not enough, Shyamalan makes Jackson spend most of his time in a wheelchair, blankly staring forward while being essentially comatose. Look, if you’re going to put Sam Jackson in a bad movie, you need to at least let the guy chew up the scenery for every second he’s on screen. “Glass” isn’t as big of a catastrophe as “After Earth” or “The Happening,” but it’s just slightly better than terrible. It’s almost a movie doing all it can to pick apart superhero movies while itself being a superhero movie. So, in that sense, Shyamalan has made a very “meta” film. It’s a shame that it’s such a snooze to watch because it almost seems like this once Oscar-nominated filmmaker had something to say.